Last year, I wrote a comparison between the two options available to state employees through the NC State Health Plan to help people understand the differences between the plans and hopefully make a better decision when selecting a plan for their family. I’m updating that article for to include the changes for the 2019 NC State Health Plan here. For the 2019 benefit period, North Carolina state employees have two possible choices for their health insurance plan: 70/30 and 80/20. This article will cover the differences between the two plans and identify the types of families that would benefit from each option. I think the NC State Health Plan is one of the best health insurances you can have in North Carolina, so you are already somewhat ahead of the game with either option. However, because the two plans offer very different benefits, there is usually a “better” choice for everyone and the difference could be significant. The plan did not actually change much for 2019, so I’ve essentially re-used most of my article from last year and updated it to include the new numbers. I hope this helps! While most people focus on the cost of their monthly premium, that is not the only factor in your yearly healthcare expense. Sometimes, it makes more sense to pay a higher premium for better coverage if you know that you’re going to need that coverage during the year. Instead, you should try to minimize your total healthcare expense, which includes your premiums, deductibles, copayments, coinsurances, and other out-of-pocket expenses that you’ll have to pay during the year. This is a direct, side-by-side comparison of the main financial factors that come in to play with these two NC State Health Plan options. While most people focus on the cost of their monthly premium, that is not the only factor in your yearly healthcare expenses. Sometimes, it makes more sense to pay a higher premium for better coverage if you know that you’re going to need that coverage during the year. Instead of focusing on your premium payment, you should try to minimize your total healthcare expense, which includes your premiums, deductibles, copayments, coinsurances, and other out-of-pocket expenses that you’ll have to pay during the year. There are plenty of exceptions that apply to most situations, but understanding these key terms and aspects of the NC State Health Plan should help you make a reasonable prediction for your costs and set you up to figure out your own unique circumstances. Description: Your NC State Health Plan monthly premium is the simplest cost you’ll have to calculate. These are your fixed costs and the amounts you’ll be paying regardless of the real healthcare expenses you’ll have during the year. This number is 100% predictable, it does not change, and it is owed every month, no matter what. Meaning: You can consider these numbers to be the “floor” of your annual health expenses. At the very least, if you have health insurance, you will have to pay your premium. If you never went to the doctor at all, you would have to pay at least $300/$7146 each year to be covered under the 70/30 plan. Math: Multiply your premium by 12 months to get your annual expense. Description: This is a flat rate, one-time expense that you incur with every visit to a medical provider for almost any reason. If you visit a PCP or specialist, expect to pay at least this much for your appointment. Meaning: Try to predict how many times you’ll need to visit the doctor in a year and consider how much you will save from the difference in the copayment amounts. If you have been seeing the same doctor for a few years, they may be able to help you predict your expected number of visits and let you know what your provider’s plan for the next year might include. Math: The 80/20 NC State Health Plan will save you $30 per visit to a PCP, $30 per visit to an Urgent Care, and $14 per visit to a specialist. Multiply your expected number of visits to each type of provider to figure out how much money you’ll save on your copayments by choosing to upgrade to the 80/20 plan. Description: This is a variable rate that only applies after your deductible has been met. After you have met your deductible, you will owe this percentage of all health expenses incurred until you meet your annual out-of-pocket maximum. A better way to think of the deductible/coinsurance relationship is to consider two periods: before you meet the deductible, and after you have met the deductible. Before, your coinsurance is effectively 100%, because you pay for everything. After, your coinsurance gets reduced to either 20% or 30%. Meaning: If these plans were sold at a retail store, you might see this advertisement: “Buy $1,080 worth of healthcare and get your next $4,388 in purchases at 70% to 80% off!” After the plans reach their deductibles and coinsurance begins to apply, you’ll pay significantly less for every bill the rest of the year. Because you are paying more for the fixed cost of the higher premium, you’ll need to pass this point before the 80/20 plan eventually catches back up with the 70/30 plan for total expected expenses. Math: Try to predict how many times you’ll need to visit the doctor in a year and consider how much you will save from the difference in the copayment amounts. If you have been seeing the same doctor for a few years, they may be able to help you predict your expected number of visits and let you know what your provider’s plan for the next year might include. A decent estimate for visit costs would be $100 for a PCP visit, $200 for an Urgent Care visit, $300 for a Specialist visit, $500 for a MRI/CT, $2000 for an outpatient ER visit, and $5000 for an inpatient ER visit, per day. The 80/20 NC State Health Plan will save you 10% after your deductible, so you can add up the totals for however many of those services you’re expecting to use and discount 10% for the 80/20 plan to calculate your total savings. Description: This is the amount in health expenses you’ll have to pay for before your insurance starts paying for the services you receive. Consider this a yearly down payment on your future care, to be paid as you go when necessary. Meaning: Under either plan, you are on the hook for at least the first $1,080 in health expenses each year, with another $170 added under the 80/20. There are differences in copayments and prescriptions that mean the 80/20 plan will save you money in other ways during the year, but this will become a factor if you receive any of the wide variety of services that fall under your deductible. Math: Once you know which services will be applied to your deductible, the cost calculation simply 100% of the cost until you’ve met your deductible. After your deductible has been met, your coinsurance will begin to apply. I think the difference between the way out-of-pocket maximums are calculated carries one of the most important distinctions between the two plans, so I’m giving it a special section. On the 80/20 plan, there is an “out-of-pocket maximum” of $4,890 for an individual (was $6,850 in 2018) and $14,670 (was $14,300 in 2018) for a family. This is the total amount of money, not including your premiums, that you would possibly ever have to pay for your healthcare in a single year. Even if you were in the hospital from January to December, this is the most you’d have to pay on the 80/20 plan (see assumptions). However, on the 70/30 plan, there is no “out-of-pocket maximum.” Instead, the 70/30 plan has a cap on the “coinsurance maximum” at a $4,388 / $13,164 rate. Since we just covered how both plans have a deductible and the coinsurance applies to expenses after the deductible, you would think these would just be interchangeable terms. In a kind of sneaky way, this is slipped in as the biggest single category of expense for people who do end up meeting their maximums. Why? 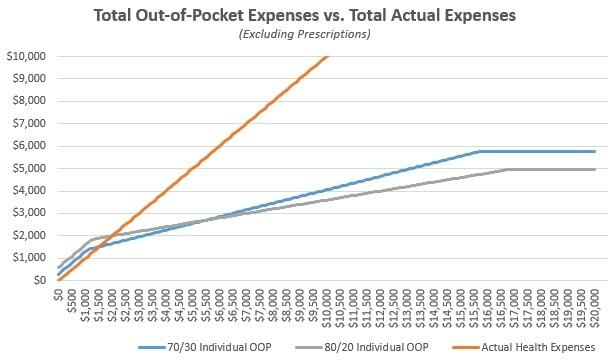 Calling something an “out-of-pocket maximum” means it includes all deductibles and copayments. Literally, everything that the patient must pay for is included in that amount. When it is termed a “coinsurance maximum,” that very specifically applies only to patient responsibilities that are deemed coinsurance; deductibles and copayments are not included in this total. Basically, you can interpret this to mean that the 80/20 plan only has a $3,640 “after deductible” coinsurance maximum that includes pharmacy benefits, while the 70/30 plan has a $1,080 medical deductible, $3,360 pharmacy deductible, and $4,388 coinsurance maximum separately. While the final out-of-pocket expenses are similar, the methods they each use to get there accumulate at different rates. Depending on where you fall on your expected usage, one side could still make a substantial difference. Make a list of your medications. All of them, even over-the-counter meds and the ones you forget to take. Look up every medication on your formulary. This is the document where you can find your drug’s “tier,” a hierarchical cost-based categorization system that the NC State Health Plan uses to decide how much you’ll pay for each drug. If you cannot find the drug, you will need to contact your insurer directly to ask about a more specific medication than they have listed in the general formulary. Estimate retail value for over-the-counter medications. There are additional pharmacy resources linked at the bottom of this page. Multiply the number of refills you’ll need by the copayments / out-of-pocket expense for each tier. You pay more for higher tier medications, so taking lower tiered or generic medications could potentially save a lot of money each year. If you take a Tier 2 or Tier 3 drug, contact your provider to see if a Tier 1 drug might be a suitable alternative. This may require an appointment or additional lab work, so take that extra cost into consideration. If you expect to be taking the medication for at least the next three months, you may be able to get a cheaper, 90-day supply by using a mail order pharmacy. If you don’t use GoodRx.com, sign up. We have discount cards at our office and would be glad to share – they send 1,000 of them every 3 months and we have way too many. Please, take them. I’ll give you 10, just in case you lose nine of them. Regardless of your insurance coverage, this site helps you find the best prices at different pharmacies and can save you hundreds of dollars on most non-formulary medications. This information should give you a good starting point for predicting your coverage, but it is not comprehensive. These are other categories of health expenses that you need to be aware of and factor in to your own personal calculations. Out-of-network expenses. Visits to an out-of-network provider are “covered” under a separate set of benefits from your in-network out-of-pocket expenses. These benefits are usually at least 50% worse and there are a lot more things that are denied or non-covered, so it is best to stay in-network for almost anything you do. The number of people covered in the Family plan. The “Subscriber + Family” option covers one kid, two kids, ten kids, or as many kids as you want to have. No matter how many kids are included, the Family Maximums are the same. If you consider the smallest “Family” to be 3 people, the price per person gets reduced significantly with every additional child. The amount of work you are willing to do. This especially applies to prescription coverage. Some of the most effective ways to save money will require you to call your insurer, fill out forms, document everything, track of receipts, and/or generally make you deal with your insurer’s customer service department. Assess how likely you are to make that effort, if needed. Unexpected Expenses. You might get lucky, but remember that you are trying to predict 2019 health expenses for your entire family in October 2018. Things can change in the next hour, much less 2-14 months from now. If you choose the 70/30 plan, figure out how comfortable you are with having an accident and meeting the maximum, then consider that additional risk when selecting a plan. The “Free” Annual Wellness Visit is not included in the 70/30’s benefits, so your annual physical will have a $40 copayment just like any other visit. The 80/20 plan covers this at 100%. For the 80/20 plan, Tier 3 drugs are applied to your normal deductible and coinsurance, instead of having a set copayment. While this probably makes the drug more expensive, having more expenses applied to a deductible is always a good thing for people who expect to hit their maximums. You could end up owing the pharmacy a lot of money early in the year, but then owe much less for all other health expenses combined for the rest of the year. The 70/30 doesn’t cover ACA Preventive Medicines, either. Basically, you should just expect to pay more for birth control with the 70/30 plan, especially for branded medications. Emergency room copayments are only a $37 difference, but the big part is in the 20% vs. 30% coinsurance owed. 10% of a single ER visit adds up quickly, so expect to pay at least $500-$1000 more for a single night’s ER stay with the 70/30 plan. Your coinsurance kicks in sooner under the 70/30 plan ($170/$510 sooner for an individual/family plan), but your coinsurance rate is slightly worse. Because the 80/20 plan “catches up” with the 70/30 at a 10% rate, it would take $1,700/$5,100 in additional health expenses under each plan to reach a break-even point where you’ve paid the same amount in “deductible + coinsurance” under either plan. The individual deductible on the 80/20 plan was reduced by $1,960, which is good news for everyone, but especially single employees with no dependents and families where one person generally uses most of the healthcare dollars on the plan. It probably won’t be fun, but you still need to do this stuff. Elect Your Plan. Kind of a weird way to say, “Choose a Plan,” but I guess we’ll go with calling it an election! You must choose the 80/20 or 70/30 plan. If you don’t make a choice, you will get defaulted to 70/30 and be charged an extra fee for the 70/30 plan for not making a choice. Complete the Tobacco Attestation Credit. Even if you did it last year, you need to do it again. This saves you $60/month on your NC State Health Plan premium under every option. Select a Primary Care Provider. There is a new link on the left side of your NC State Health Plan online account that allows you to change your PCP in just a few clicks. It was never too difficult to do over the phone, but any saved phone call to BCBS is a step in the right direction. 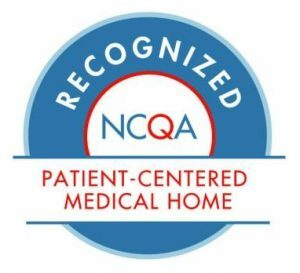 We hope you choose Family Care! Review Your Dependent Information. If applicable, make sure your spouse and kid(s) are enrolled on your plan. If you were married or had a kid since last enrollment, congratulations! Now make sure they are still on your plan! Double check that BCBS has demographic information like date of birth, mailing address, and phone numbers correct, as those can be a big hassle to correct later. Print A Confirmation Statement. This is probably the most important thing you’ll do for yourself, so don’t skip this. I have heard so many nightmare stories and have listened to dozens of patients complain about being enrolled in the wrong plan on accident, and the only ones that I’ve seen win are the patients with their own receipts and records. Do not trust BCBS to get your information correct. Stay on top of it yourself and don’t let them make a mistake that costs you coverage, money, and sanity. As with everything in healthcare, the standard “subject to individual determination” disclaimers always apply and nobody will, or should, give you a definite answer. I cannot tell you which plan you should choose, but I think you can use this guide to make that decision on your own. All you can do is make the best estimate possible with the information you have at the time. Someone telling you they can accurately predict your actual health expenses is either lying, inexperienced, or delusional. Be ready to adjust if something does happen with your health and you need more extensive care than planned. Factor that potential into your decision and always be prepared for the worst-case scenario. I’ve found it is always better to be relieved things weren’t as bad as you thought, rather than being mad that they were worse. For most people, your realized benefits under either plan will always be within a few hundred dollars of the other, so don’t stress out about the decision too much. This decision is not going to bankrupt you if you make the wrong choice. Either way, you will still have a plan that is better and cheaper than anything you could get on the individual marketplace. Thank you for reading! I hope this helps you decide. Contact Ryan if you have any questions! During the article, I left out mentioning many of the exceptions and individual circumstances that are possible with the NC State Health Plan. The article was already 3300 words, so I thought I’d save the trouble. Here are a few assumptions I made for all of the pricing and cost examples. This is a breakdown of the distinct categories of expenses that you’ll have under either plan. Since it would be a little too confusing to talk about each of the 16 possible choices, I’m only using the “Subscriber Only” and “Subscriber + Family” plans as the low/high-end examples. You should adjust the numbers slightly if you choose the “Subscriber + Child(ren)” or “Subscriber + Spouse” options. These numbers also assume that you will complete the Tobacco Attestation document and save $60/month on your premiums. If not, you should expect to pay an extra $720/year in premiums, but the rest of the expense calculations should remain the same. I am also assuming you use a Blue Options Designated Specialist, visit your Selected Primary Care Provider for primary care services, and only visit in-network providers for all your healthcare needs. If you seek services under any other designations, you should expect to pay more.